Have you heard of the huge pillow sensation for kids called Pillow Pets?! Not only have I seen them on TV but I actually passed by a stand filled with these cute, fluffy guys at the mall not too long ago. Well Pillow Pets has a wonderful promotion going on right now where you can purchase a Limited Edition Pillow Pet Patriotic Pup. $5 from every purchase of this limited edition pet is donated to scholarships for military children. How cool is that?! So what is a Pillow Pet? A Pillow Pet is a special pillow that looks like your child's favorite animal. There are so many animals to choose from, too! From elephants to frogs there is a pet for every child. And if you know children you know they also love having a special snuggly friend that is just for them! One reader is going to win a Limited Edition Patriotic Pup Pillow Pet!!! Don't forget to purchase your own Patriotic Pup and help support education for children in the military! There are a limited supply of these cute pups so hurry! Leave a message of support and thanks to the troops in your comment! Also feel free to tell me about someone you know and love who is serving in the military, has died for their country or how you express your gratefulness for your liberty and freedom! 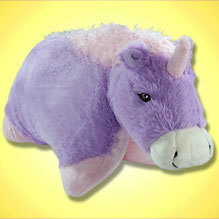 -Tell me about another Pillow Pet you have or love! I am so appreciative of our troops for what they do!! Particularly a family friend, Dale, who served overseas. 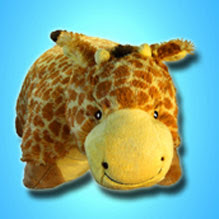 Now, allow me to tell you that I SQUEALED when I saw you were doing a pillow pet giveaway. Ally has been BEGGING for one of these for 3 months. I have utmost respect for our troops- My dad served in Vietnam and I am proudly displaying his flag on a shelf in the family room so I can remember what a great sacrifice our Americans make when they go overseas. My brother in law is currently serving in the Marines and deploys to Afghanistan shortly, leaving behind my 3 nieces. Hopefully one day they will ALL come home. THANK YOU TO ALL WHO SERVE OUR COUNTRY!!! I am so thankful for each and every man and woman who give up their families to protect ours! I love living in the USA and thanks to our troops, we can do so with Freedom!!! God Bless them all, and may God bring them all home safely! I entered the Lil Miss Polka Dot giveaway!! My daughter has the ladybug pillow pet, and she LOVES it!! Its the greatest on car rides!! I follow Girly Girl Giveaways!! My "adopted" nephew is a Marine, makes me so proud and thankful. These people are awesome to sacrifice so much for us! we don't have a pillow pet yet, but chase has seen them on tv and wants one so bad! Thank heaven for the men and women of our armed forces who sacrifice so much for our country. I am truly thankful and appreciative for ALL of the sacrifices soldiers past and present and their loved ones have made for America! Thank you! Thank you to my little brother who after eight years and one very long deployment just got out of the Guard. and Last but not least, my amazing husband, who is the most honorable man/soldier/human being that I know. I'm so very proud of him!! I am so thankful for our military and their families who are willing to sacrifice for our freedom. My twin brother leaves his new bride in two months for Afghanistan. The moose, lion and penguin are all favorites around here. I am so grateful for the men and women who put their lives at risk to protect our country and our lives. My cousin's husband is in the Air Force, my brother-in-law is an Army photographer, my uncle was an engineer at Boeing, and my grandfather was in the Army and stormed the beaches at Normandy (he was wounded badly there, and while in a hospital overseas, the guy in the bed next to him got his girlfriend's friends back in the US to start writing to my grandfather -- it's how he met my grandmother, via letters during the war). I fanned you on Facebook, too. I thank God for our troops everyday because I am free to do what I want to do and not what the government wants me to do. I can speak freely, I can walk down my street freely and knowing that my granddaughter will grow up free is a blessing. Thank you one and all, God Bless Our Troops! My granddaughter has the Wiggly Pig Pillow Pet. I really appreciate the sacrifice soldiers make for us every day! My sister-in-law is a veteran of the Iraq war and I know it was difficult for her and definitely a sacrifice. I hope every day for the safety of troops! I love the panda pillow pet too! We support our military... especially since I used to be in & hubby still is! Freedom isn't Free!! Thanks to all the soldiers still overseas, away from their families, fighting for our freedom!! Thanks to all the troops, everyone of them make a difference!! A special thanks to my Dad and Brother, both military vet's!! I love the frog pillow pet, too cute!! I lost a very good friend in Iraq. It breaks my heart to think of all those that have lost someone or who are without their loved ones. Thank you for all you do!! my son really wants a pillow pet, I think he'd like the patriotic pup a lot but he'd like the regular Pup too!! Thank you troops for all you do in those war areas! What a fun giveaway! I'm grateful for the sacrifice each troop (and their families) makes to help serve our country. Both my grandfathers and an uncle, as well as my father-in-law have all served in the military, for which I am grateful. I truly appreciate all that the military has done for our country and our family. I am so appreciative and thankful for the men and women who protect our country and our freedom every day! My son really wants the penguin pillow pet! My husband is in the military and I appreciate all the sacrifices that service members make! Our military is awesome!! I also love the duck pillow pet! I am very grateful for everything are troops and their familes go through to give us are freedoms.